Should I do North, South, East or West Rim Grand Canyon? The name “Grand Canyon” gives away one obvious truth about the place… it’s Grand. The name Grand implies a landmark of monumental proportions… literally hundreds of miles of desert landscape like you’ve never seen it before. What most people don’t realize is that there are 4 distinct regions of the Canyon… all amazing in unique ways. These are the North, South, West and East Rim. Let’s cover what’s at each, reasons why you might choose one over the other, and how to access them. 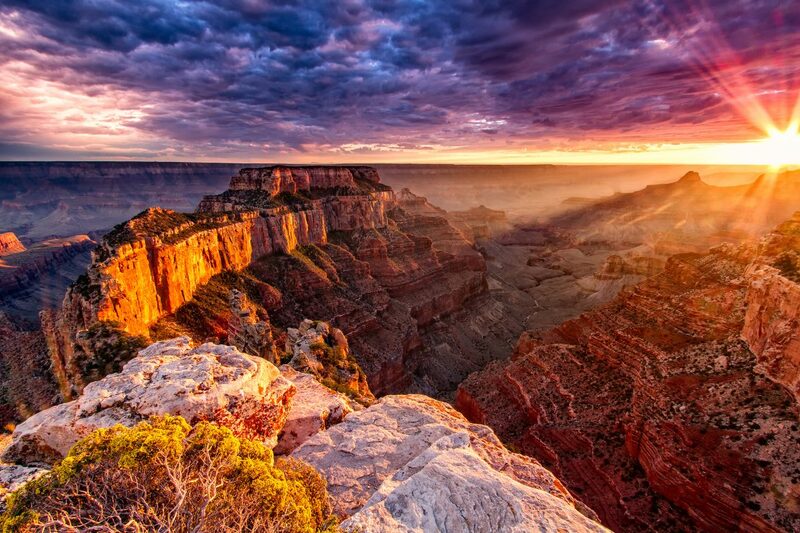 Features: The South Rim is the most popular region of Grand Canyon. It is America’s most famous National Park. It’s where most of the trails, outlooks, museums and drives are accessed from. The widest point of Grand Canyon is viewable from here and there is ample accommodation both inside the Park and in the nearby town of Tusayan. Pros and Cons: It’s the most iconic part of the Canyon for a reason. It includes the widest and deepest views and the most activities to partake in. Those are the pros. Cons? Crowds. In mid summer you should make reservations for anything you plan on doing ahead of time. 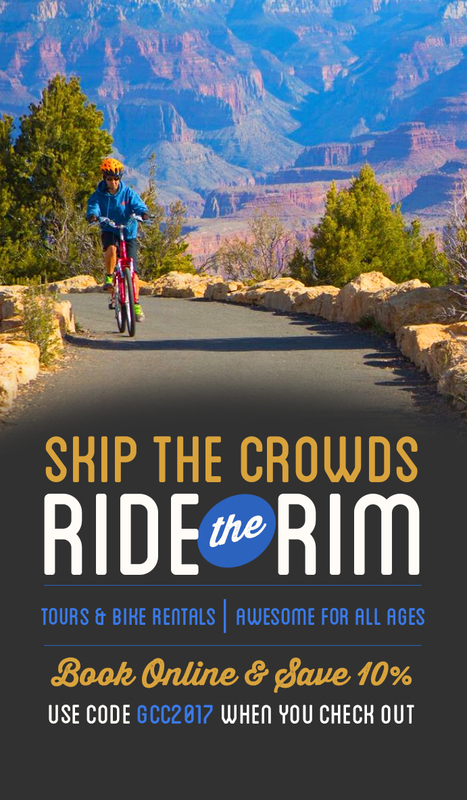 We recommend doing a bike tour to escape the crowds and ride the rim side trails. Or do a hike if you’re in good physical shape! Both will get you away from the masses. 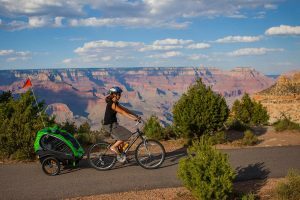 Features: The North Rim is only a few miles as the crow flies accross from South Rim village, however to get to it by car, one must drive all the way around the Canyon. The North Rim is 1000 ft higher in elevation and is a lot more treed than the South Rim. For this reason, it has a different kind of beauty… some say more than the South Rim. It is also run by nps.gov. Popular Activities: Hike into the Canyon on amazing trails, view the sunrise or sunset from some of the most iconic view points including Zoroaster Temples and Imperial point. Mountain bike along the rim. Star gaze like you’ve never done it before. Less people, less lights, more stars! Pros and Cons: The North Rim is much further from most centers than the South and while this is it’s biggest con, it’s also it’s biggest pro because it means less people. This side of the Canyon however does close during winter because of it’s higher elevation and significantly higher snow fall. Check the NPS for when it opens and closes. (typically May- October). 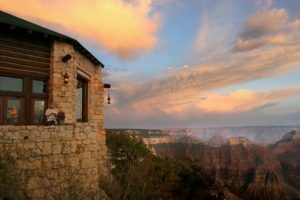 Features: The West Rim is owned and operated by the Hualapai Tribe. This is the part of Grand Canyon that is most accessible from Las Vegas. Popular Activities: The skywalk which is a glass bridge extended over the edge of one of the cliffs is the most popular attraction. There are also flight tours and river trips that explore the lower end of the colorado. 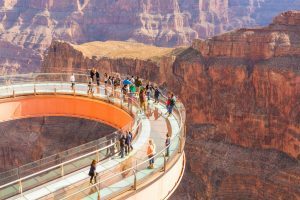 Pros and Cons: The pros are that it is close to Las Vegas and you can access the skywalk which is not available at other parts of the canyon. The cons are that this part of Grand Canyon is far narrower … it is not the part of Grand Canyon that you are used to seeing in pictures. It’s worth noting however that if you can’t make it to the South Rim, that this part of the Canyon is still worth seeing. Driving Distance: 37 min (23.7 mi) from South Rim Village. Features: The East Rim is inside the main South Rim National Park and should be explored while you’re at South Rim . It is the drive east of the main village. This region however also loosely includes the Lake Powell/Glenn Canyon/Little Colorado area which are outside of the part boundaries. 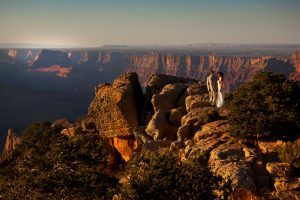 Popular Activities: Desert View Watchtower and the surrounding center is an awesome thing to experience, Grandview Trail departs from the East Rim, Watching the sunset at Lipan point, and activities outside the park boundaries can be seen on this page. Pros and Cons: This part of the park offers more sweeping open views of the canyon and some awesome river views. It is a bit quieter than the main part of the South Rim. It has less amenities and less trailheads accessible but does have food, gas and camping. These two regions are outside of the National Park System and are run by the tribes. They are still however part of the Grand Canyon. The waterfalls at Havasupai are incredibly iconic and highly sought after. It’s a bit tricky to actually gain access to this part of the Canyon. 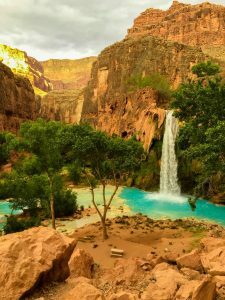 If you’d like more information on Havasupai click here or Little Colorado. Really the only way to see the whole Canyon on one trip is by doing a Grand Canyon River Trip. More info available at http://raftarizona.com/ – you will literally see all the parts listed in this article if you do a full length river trip. NPS.GOV and Grand Canyon West are your best sources of direct information about the parks and their amenities.